The day before the festival, however, the organizer announced that Bömmer unfortunately wouldn’t be able to play. Several of the attendees noted that this was a “bömmer” – some were even convinced that the band chose their name for the sole purpose of that pun. 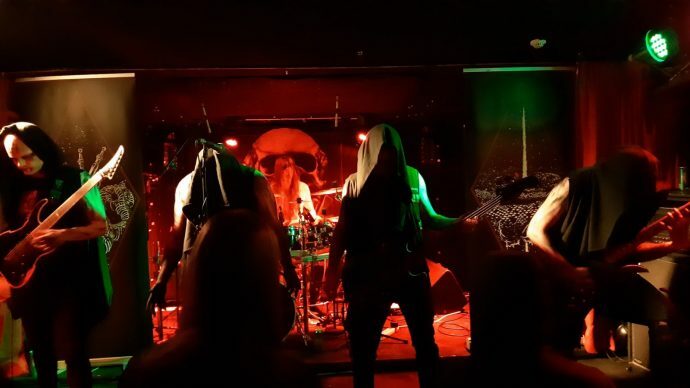 Anyway, with Bömmer not playing, the final lineup consisted of the bottom seven bands, most of which should be familiar to the avid reader of this blog. Nevertheless, for those who don’t know all the bands, or for those who simply want something to listen to while they’re reading, I’ve made sure to include a stream for each of the bands below. 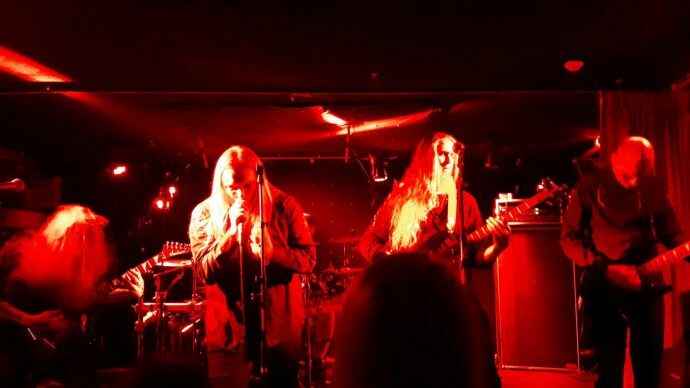 The festival took place at Gaukurinn, a small bar/venue in downtown Reykjavík, one floor above the venue that hosted the three installments of the (now discontinued) Oration festival. Once I had ascended the stairs at Gaukurinn, I was greeted by rainbow striped pennant banners and multi-colored string lights hanging from the ceiling and on the walls – a tad more colorful than the impending concerts of the night. Apart from this, the venue was fairly inconspicuous, with dark interior and appropriately dim lighting. Although I wasn’t the only foreigner attending, I suspect I may have been the only one who traveled to Reykjavík exclusively for this festival. The organizer, who had taken notice of the Norwegian flag on my jacket, was very pleased to hear this when he approached me for a chat at the end of the night. And kudos to him for arranging this ambitious event, because with seven bands playing the same night, there obviously wasn’t much time for breaks in between the shows. During the shortest break, there was barely enough time for people to buy a drink before the next band started playing. So, as you have probably inferred, this night had a lot of music to offer! The first band of the night was World Narcosis, which was the only band I didn’t know prior to the festival. They sure knew how to make themselves known, though, because the concert was loud, even with earplugs. Seeing as they were the first band to play, and because it was still relatively early in the evening, there wasn’t a big audience in the venue. However, their setup, which was on the floor just in front of the stage, helped fill the venue and provided a more intimate experience. With the band playing in the audience area, the crowd formed a semicircle around them, which brought the entire audience closer to the band. The vocalist made the most of this by screaming his shrill, wailing vocals in the faces of most people in the crowd. The bassist also occasionally joined in with some downright enraged screams. 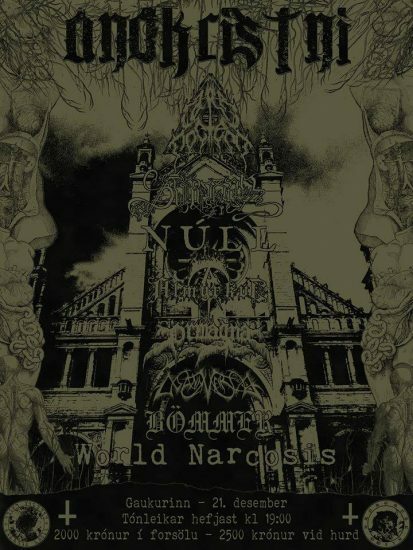 Although their music isn’t pure black metal, the band still had that distinctive, dissonant sound that is manifest in a lot of black metal from Iceland. Akin to the piercing screams by the vocalist, the guitars were also ruthlessly penetrating. All this, together with aggressive drumming that overtly inspired headbanging, made for a both discordant and intriguing show. For the next concert (as well as all the subsequent ones) the instrument setup had moved from the floor area to the stage. 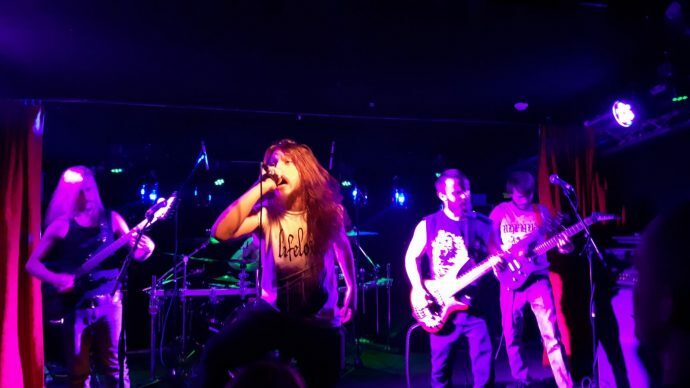 Örmagna was the first band to use the stage, and they delivered a show that was quite the contrast to their predecessor: The sound level was easier on the ears, and their music was decidedly less infuriated. They also had a less dissonant sound than their Icelandic brethren. But don’t let that introduction fool you; this show was not something you would want to miss. The third band to play this night was Mannveira, who prompted a return to aggression and dissonance. Mannveira is a band I’ve had the pleasure of seeing live multiple times before, but unlike the previous shows I’ve witnessed, their faces weren’t smudged this time around. 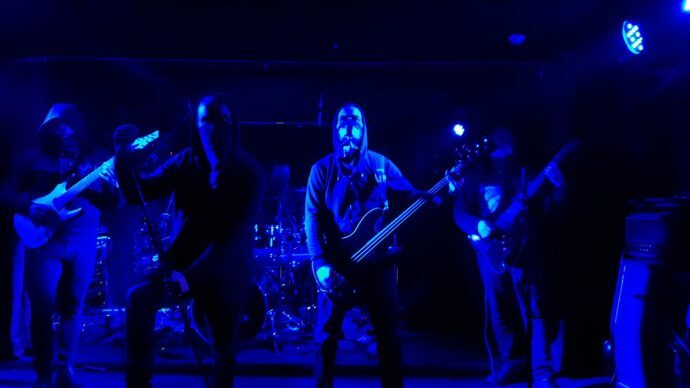 While I can certainly appreciate the use of face paint in black metal, I actually think the clean faces were a better fit for Mannveira’s callous on-stage attitude. Their appearance wasn’t the only thing that was sharpened, though – the musical performance was as intense, bludgeoning, and fierce as ever before. The concert had an excellently intimate ambience, but that didn’t compromise the band’s relentless manner. Rather, with an unyielding shade of red as the only stage light, their demeanor seemed even more forceful. After experiencing this refined audiovisual concoction, I daresay this is the best Mannveira show I’ve seen to date. Next up was Almyrkvi – another band I had seen live before, but only one time. At this point, enough people had turned up to make the crowd feel like a proper audience; less scarce and scattered than during the previous three shows. Although I had seen the band live once before, the sound on that occasion was horrendous – a fact I had somewhat forgotten, so my expectations for the concert were quite moderate. However, the moment the band started playing, it became immediately obvious that my subdued expectations were completely unwarranted, because the sound this night was absolutely supreme. The lead guitar was distinct and clear, and it masterly carried the soaring melodies along the atmospheric droning from the rhythm and bass guitars. Amidst this stellar choir of strings, the frontman chanted with an impressive variation of clean and guttural vocals. The musicians maintained a steadfast composure throughout the show, illuminated only by an austere blue light that gleamed with fluctuating intensity. The calm aspect of the band in the algid light ensured that there were no visual distractions, which further amplified the spellbinding musical experience from beginning to end. This concert was the definite highlight of the night! 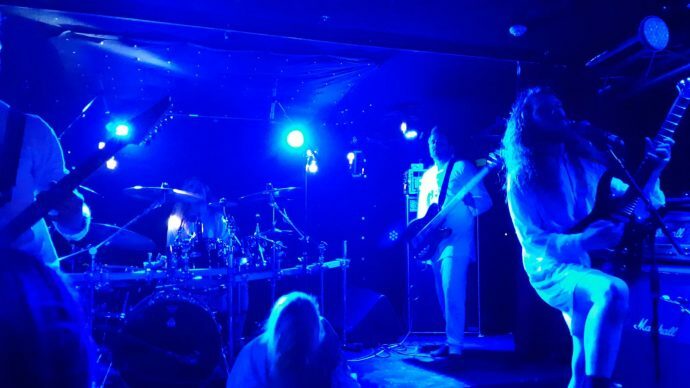 As the fifth band of the night, 0 entered the stage, with all band members wearing entirely white outfits. 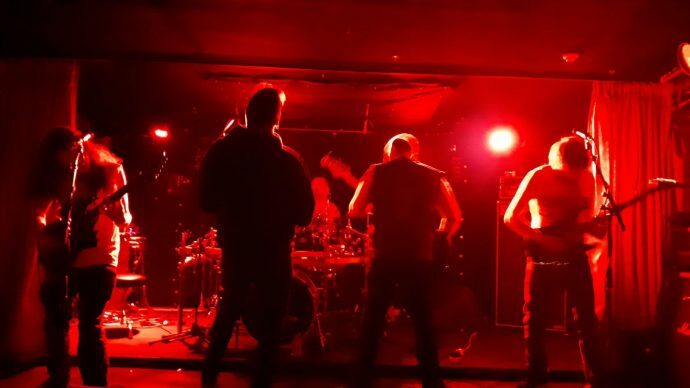 0 was another band I had never seen live before, mainly because their shows are scarce – something their drummer has told me, half jokingly, is in the spirit of the band. It was also the band I was most eager to see this night, which might have inflated my expectations for the show. 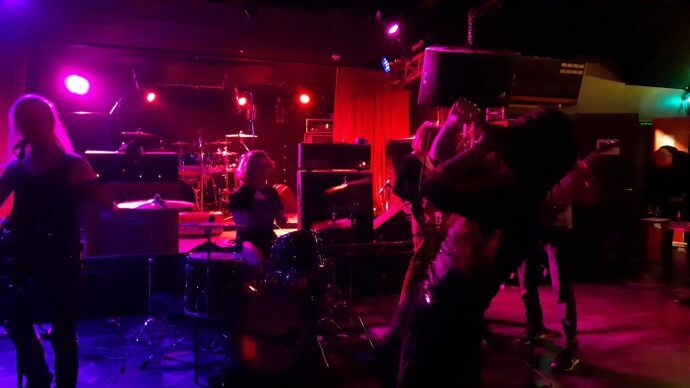 The band put on a solid performance, with vehement drumming and powerful cymbals that stood out with ferocious presence. The vocals were generally bleak and harrowed, but were occasionally undermined and dulled by being spread among more than one vocalist. However, despite all the power and anguish, the music sounded feebler and less vexatious than on the studio recordings. It also didn’t help that the sound was inferior during the first part of the concert, which caused the vocals and the lead guitar to be drowned out by the rest of the instruments. During the show, the band played some tunes from their upcoming album, which, I’ve been told, is almost completely recorded. The schedule didn’t allow for their entire debut album – a single track of almost 35 minutes – to be played in addition to the new material, so the opus was thus broken into fragments for the concert. Though, without being connected to the rest of the composition, the selected fragments felt a bit weak and out of place. With these unfortunate aspects, the concert as a whole ended up being somewhat disappointing. Hopefully, I will get to see them again in the future, with a far superior show. Sinmara was the penultimate band of the festival, and they delivered a rock-solid concert exactly as immense as you would expect if you’ve been exposed to shows by this band before. Although the band had a generally stoic bearing on stage, the sheer massiveness of the sound made it evident that this performance was bursting with force and vigor. The guitars, for instance, were played with such vehement determination that I half expected the strings to break at the impact of the most sonorous chords. Plus, these guys certainly know how to enthrall the audience! With the mighty drums, riveting cymbals, frenetic guitars, and tremendous dynamics that the band concocted, all I could do was to let my consciousness be carried on the waves of the sonic sea that engulfed the room. The final act of the night was Carpe Noctem, yet another band I had never had the pleasure of witnessing live before. Their shows are apparently quite rare due to the fact that the band members are scattered across four different countries, which understandably complicates such arrangements. According to the organizer, the band hadn’t played live for the past two to three years prior to the festival. The concert showed no signs of that, however, as they conjured a massive, yet dynamic, show where every instrument was expertly balanced. This was especially apparent for the bass guitar, which generated a cataract of striking bass lines, without drowning out the other instruments. Pervading the soundscape was also a rockslide of toms and bass drum that thundered away with a potency that can only be accomplished live. To my surprise, the guitars actually had a less dissonant sound than on the studio recordings, but they still felt every bit as vital and appropriate as on the recordings. With the powerful dynamics and extraordinary soundscape these guys created, seeing the band live was a truly unique experience. I’m already looking forward to the next concert – June can’t come soon enough!